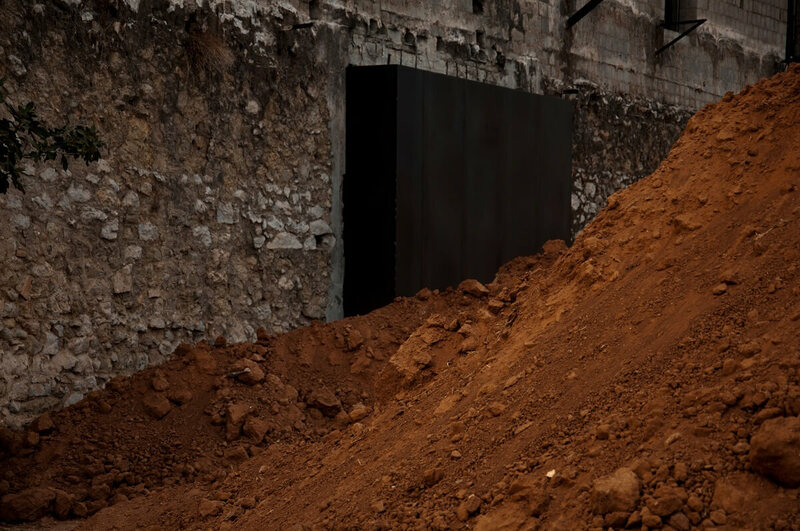 We are pleased to announce the opening of Eleni Panouklia’s large-scale, site-specific installation Ό,τι φωτεινό έχει να πει, θα πρέπει να μείνει εικασία(Its luminous saying must be left a conjecture) at Palaio Elaiourgeio, Eleusis, commissioned by Aisxylia 2016. Meant to be experienced at night, Its luminous saying must be left a conjecture is a mixed-media intervention that occupies select spaces of the complex of abandoned manufacturing units known today as Palaio Elaiourgeio (Old Oil Mill) of Eleusis, converting industrial ruins into an evocative earthy soundscape of dark paths and inaccessible sanctuaries. Beginning and ending in the backyard of the derelict factory, it consists of two cyclically communicating outdoor and indoor environments that entail separate explorations—both collective and private. The work immerses the viewer in a contrapuntally structured experience of darkness by transforming the backyard of Palaio Elaiourgeio into a disorderly, pulsating landscape of powerful sonorous enclosure and combining that with a lonely ritual itinerary through the silent passageway of a long building, where an interactive event awaits each viewer. Together, the two environments seek to affectively advance both timely critical and timeless existential realizations through distinct bodily and reflective enlightenments, or, better yet, “un-concealments” of the wholeness of being in darkness. Its luminous saying must be left a conjecture is dialectically shaped in response to the ruinous morphology of Palaio Elaiourgeio and the polysemy of Eleusis. As a rather hopeful artistic contemplation on the hidden harmony of the world, it also responds to the nightmarish darkness and disorder that underpin life in Greece since the recent crisis, along with the sociopolitical, environmental, cultural, and personal symptoms of Western civilization’s decadence during the current state of global capitalism and the hypertrophy of spectacle. As such it expands Panouklia’s interdisciplinary artistic preoccupations, putting them firmly under the light of Heraclitus’ understanding of the unity of opposites and his dialectic approach to the hidden truths of cosmic logos. With a title whose enigmatic character fittingly hints at the mysticism of the celebrations of life and death in the Eleusinian Mysteries, Its luminous saying must be left a conjecture orchestrates the awakening of multisensory explorations—of the visible, the invisible, and the unhoped for—for the man of contemporary society. If it has anything luminous to say, as implied by the title’s own Heraclitean ambiguity and the optimistic openness of Panouklia, it is up to the viewer to gather it out of the darkness of the historic moment and Western thought, including that of this work. By addressing, however, the visitors, both individually and collectively, as embodied, thinking, and inevitably political parts of a tragically oppositional yet wise whole, Panouklia prompts a demystifying initiation to the unity of being as the “enlightening” means for man’s self-knowing rise out of the individualistic and materialistic impasses of our culture that raises the timely issue of the inextricability of personal and collective responsibility for the fate of humanity, democracy, and our planet. Coti K.: Constantino Luca Ronaldo Kiriakos (b. Milan, 1966) moved to Greece at the age of 6, where, better known as Coti or Coti K., has been involved in various pioneering electronic bands since the mid-1980s (such as Ricochet, Dada Data, Row, Spiders’ Web, and In Trance 95). He works as a musician, composer, installation artist, record producer and sound engineer, and has collaborated, among others, with Tuxedomoon, Stereo Nova, Blaine Reininger, The Raining Pleasure, Nikos Veliotis, Ilios and Dimitris Papaioannou. He has released various solo CDs, written music for film, theater, dance companies and TV. This is his second collaboration with Eleni Panouklia. Kalliopi Minioudaki: is an art historian who works as independent scholar, critic and curator in New York and Athens. She holds a PhD from the Institute of Fine Arts, NYU and specializes in American and European postwar art from a feminist perspective. Her writings have appeared in several publications and exhibition catalogues, such as Rosalyn Drexler: Who does she think she is? (Rose Art Museum, Brandeis University, Boston 2016); The World Goes Pop (Tate Modern, London 2015); Niki de Saint Phalle (Grand Palais, Paris, 2014); Robert Indiana: New Perspectives (Hatje Cantz, Berlin 2012); Irina Nakhova (Moscow Museum of Modern Art, Moscow 2011). She was curatorial associate of Seductive Subversion: Women Pop Artists, 1958-1968 (University of the Arts, Philadelphia and Brooklyn Museum of Art, New York 2010-2011) and co-editor and co-author of its catalogue. Recent projects include the special volume On the Cusp of Feminism: Women Artists in the Sixties (Konsthistorisk Tidskrift, 2014); the exhibition and catalogueCarolee Schneemann: Infinity Kisses (The Merchant House, Amsterdam, 2015) and co-curating Fireflies in the Night and Fireflies in the Night Take Wing(Stavros Niarchos Foundation Cultural Center, Athens, 2015) with Barbara London, Francesca Pietropaolo and Robert Storr as Artistic Director.